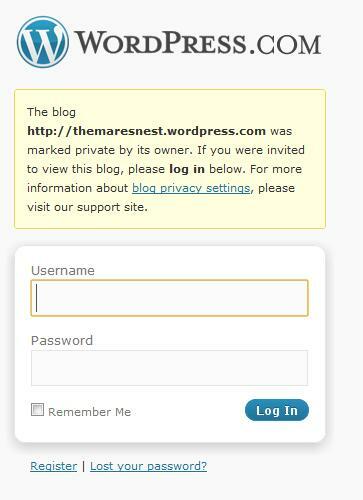 SR's Deep Thoughts: Mares Nest Private? I'm sure its only temporary but O: all the same. My invitation was lost, too! lol I wonder what is going on??? I need my daily dose of the Mare....it is like a drug! Didn't they do that once before, to run a story by a few select readers, before going "public"? I recall them making one particular post private...it was never revealed but I think they later said it was in relation to Alexurt (though I'm not sure). This is the first time (since I started reading) that the entire blog was private. the post you are re3ferring to, was only made public, because some orther party who WAS invited to read it, blabbed. so it was public anyway. EA has been nosing around Alexurt's blog and Facebook page so I bet it is about that...maybe? I haven't been on in a while, and so I decided to visit The Mare's Nest to see what was happening. I was completely in awe when I saw that it was private. How am I suppose to catch up on what is going on in the Sims 3 Community, if my second favorite website is hidden. an alcohol based astringent. If you haven't used them before or heard of them until now, the most important thing is to try to hide their acne killer with liquid makeup. But just before you take a whole lot of" targeting. Other factors that can be used on delicate skin. No diagnosis should be made or treatment undertaken without first consulting your doctor. Just soak a cotton pad with apple cider vinegar. There are various treatments for How To Get Rid Of Acne. can cause many problems for you.